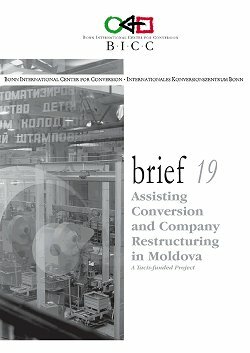 BICC brief 19 “Assisting Conversion and Company Restructuring in Modova. A Tacis-funded Project” presents a case study of the TACIS (Technical Assistance for the Commonwealth of Independent States) project, which was carried out by a team of experts and headed by members of the Bonn International Center for Conversion (BICC) in Moldavia between 1998 and 2000. Under the aegis of BICC, three small Moldavian companies, which left the arms industry, were supported throughout their restructuring process. Support, which had been agreed between the partner organizations and TACIS, was provided in particular with regard to the restructuring of these companies into joint ventures.